It’s that time of year again: Barbara at Winos and Foodies is hosting her annual event, A Taste of Yellow. 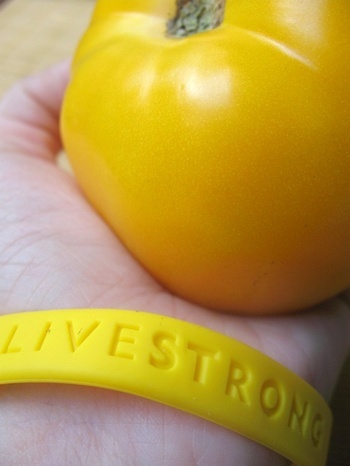 This time around, she’s added a new element – including a liveSTRONG wristband into your photo. I have been madcrazy busy with work, so I’m afraid that my photo is a little uninspired. However, I am still thrilled to take part. Thanks for the wristband, Barbara! In honor of this awesome blog event, I made up a little yellow tomato salad (with a smattering of feta cheese) as a vehicle for my new favorite salad dressing in the world: a tangy, mustardy tarragon vinaigrette. It was originally used in a Salade Nicoise recipe from Tyler Florence (swoon)…but since my friend Tony and I made that salad, I have been thinking and thinking about the dressing. He made a batch for a salad the other evening and I fell in love again. It’s the perfect salad dressing: flavorful and herby enough to compliment everything from mixed greens to slabs of fish. A word of advice though when making this salad dressing: double the recipe. Trust me. Great photo Tami. I’ve never added tarragon to a dressing so will try it as soon as I find some. I love tarragon in vinaigrettes! This one sounds fab. Oooo… I love tarragon, and in a vinaigrette it sounds fabulous. Will check it out! Approximately how much sea salt & pepper do you use? The salt and pepper amounts are really to taste. Depends also on what type of mustard you’re using. I would add a little, shake it up, taste and adjust from there! I love to eat this raw. Only with salt. This is so delicous when eaten raw.